On a cold rainy Saturday morning we took the kids to the museum (www.otagomuseum.govt.nz). The ‘hands on ‘ science experience’ section for kids caters for all ages and the butterflies in the tropical forest exhibit are a joy. The tropical heat was a treat, but I could not un-layer enough and was perspiring towards the end of our visit. 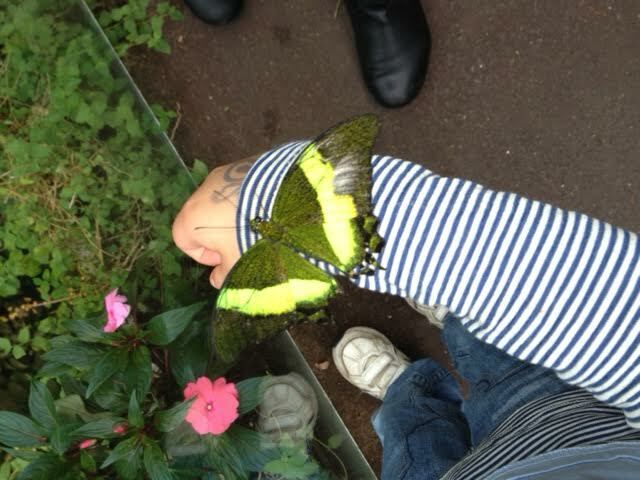 We were in time to see a release of a batch of ‘new’ butterflies and the kids had butterflies perched on their hands and shoulders, and one of them had to be reminded that breathing would not dislodge the persistent butterfly on his arm. But the most marvelous thing about the museum visit was the ‘science show’, presented by an enthusiastic young paleontologist. This is the type of scientist we need – the non retiring kind – a showman who can make science exciting and fun. His audience ranged from 4 (my grandson) to ancient (me) and everyone was kept on the edge of their seats throughout the show. There was smoking liquid nitrogen, water cold enough to be from the Antarctic, fossils passed around, flaming helium and exploding balloons. Wonderful stuff and the scientist kept everyone in suspense and never disappointed with the outcome of the experiment. Congratulations to the museum for the contribution I am sure it is creating an early interest in science, especially here, in lovely Dunedin! ← POOR POOR SERVICE !!! The day was good and everybody still talks about it every day. The Otago Museum is absolutely wonderful. When we lived in Western Australia, there was a place called Scitec that was a fantastic museum of science for kids to explore and it had all kinds of amazing things going on and the exhibits changed on a regular basis. We don’t have anything like that here but the museum in the city does have a planetarium so that is something. Will have top come and see!